The Tasmanian Museum and Art Gallery (TMAG) Annual Report tabled today confirms strong growth in visitation for the third consecutive year. In the last year visitation to the Museum’s city site has increased by eight per cent to over 436 000, up from 403 662 in 2016-17. This represents continued growth of around 21 per cent over the past three years. When TMAG’s house museums and research facilities are included, total visitation rose to just over 446 700 over the past year. This is a great result that confirms TMAG’s standing as a cultural and tourism drawcard for the state. There is no doubt that TMAG’s continued success in delivering a vibrant and engaging schedule of exhibitions and public programs, have contributed to the growth. 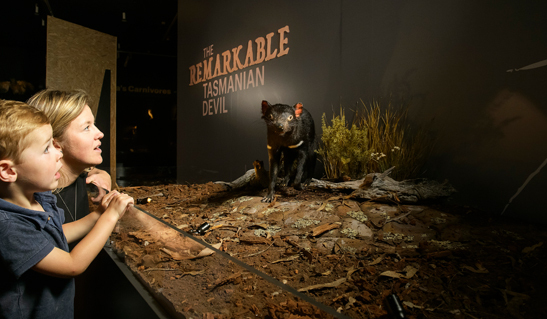 Exhibitions such as The Derwent and The Remarkable Tasmanian Devil, showcasing some of our most beloved Tasmanian icons, generated very positive feedback from visitors throughout the year. These two exhibitions were also recognised at a national level by achieving ‘highly commended’ in the Temporary and Travelling Exhibitions category at the 2018 Museums and Galleries National Awards (MAGNAs). In further good news, the TMAG annual report shows TMAG has also made significant progress towards sustainability by developing a sound financial base and balancing its budget for the third year in a row. As a result of the Government’s commitment to establish a more contemporary governance framework for the museum, the Tasmanian Museum and Art Gallery Act 2017 came into effect on 14 February 2018, establishing TMAG as a statutory authority with a broad skills-based Board. The Government will continue working closely with the TMAG Board of Trustees to ensure TMAG is well positioned to deliver on its strategic objectives and is able to support the continued growth of Tasmania’s cultural and creative industries and visitor economy. Chair of TMAG’s Board of Trustees, Mr Geoff Willis AM is very pleased to report that the 2017-18 year has been one of significant progress for the museum with excellent outcomes across the board. “TMAG’s performance during the year was highlighted by inspiring exhibitions, important research, development of the collection and all of this was achieved within a tight but balanced budget”, Mr Willis said. “We are already seeing the benefits of the change to TMAG’s governance arrangements with clearer accountabilities for the Board, the Director and the management team”. “As a statutory authority, TMAG is now better placed to forge collaborations and seek community support, alongside working with the Tasmanian Government as the State museum and art gallery”. “We are grateful for the confidence expressed in TMAG through the announcement of future funding to create new facilities for children at TMAG over the next three years, and the support for the TMAG Foundation in proposed matching funding as we seek to continue to grow TMAG’s fundraising capacity in support of the museum’s key strategic priorities”, Mr Willis said. Download the TMAG annual report 2017-18 here.